Probably most people have Italy as one of the places they would like to visit in their lifetime and who can blame them if Italy is a place of true fascination. Beside the arts, architecture and their distinctive popular food, this country is also home of some of the most beautiful women in the world. Italy is the home of the fantastic Giorgia Palmas who almost won the world's greatest beauty contest back in 2000 and the amazing Sofia Bruscoli, finalist of Miss World 2005. It is still unbelievable that Italy have not yet won the Miss World crown since its debut in 1954. This year, the stivale will be represented by Giada Pezzaioli who won the Miss Mondo Italia 2010 title last June. TimesOfBeauty.com proudly presents Miss Mondo Italia 2010 in an exclusive interview for our series Meet the Misses. My name is Giada, I am Italian and I live in Montichiari (a town in province of Brescia). I am 17 years old and I study languages at school (English, French and Chinese). I consider myself a really busy person, in fact when I was 14 years old I started working in a restaurant as a waitress. I started to work because I wanted to be independent for personal pride. I learned lot of things thanks to this job and now I feel really happy because I had this opportunity. For me it is very important to be conscious because if you are conscious you can change situations in a best way. While I was studying and working in the restaurant, I started working as a model because this is my real big dream. Sometimes I also have time to relax myself, and what better place than nature? I am in a special harmony with nature and animals since I live in countryside and I have animals (rabbits, goats, pigs, ducks, and chickens). Harmony between mind and body is the best magic potion! 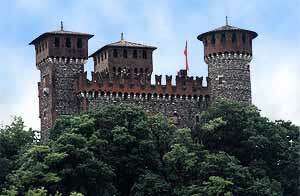 I live in Montichiari, a town in province of Brescia witch has 22,452 people. It is a quite a big service center, in fact we have an airport that is growing in importance, we have lots of services for example the stadium, the theatre, a new library in memory of Giovanni Treccani the founder of the famous Italian encyclopaedia of arts, sciences and literature published between 1929-1937, and a wonderful castle founded by a wealthy banker approximately in 1892. For me it is something to be proud, I want to represent the best of my country and of course I want to do my best. It is difficult to embody all people of my country but I am sure I will try to include all them with my positive attitude, my wonderful lifestyle and with the desire to overcome life's challenges in the best way. I will continue to engage my self physically and especially psychologically to reach the final of Miss World at my best. I am concentrating my energy to reach this unforgettable goal! Meraviglioso! Wonderful. Why? Because I think that I am special and unique with my virtues and my limits and also since I am not perfect I always try to improve myself …this is a successful tool for me! Day after day I plan my life through words, thoughts and projects with my future in sight. 10 years from now I see myself really busy in work, I see all my dreams booming in particular I have an image of myself as a famous top model. Why not beautiful, rich and smart? I think a person has to imagine him or her ideal condition (psychological and physical) and try to reach it! I admire an incredible man, Pope Karol Wojtyła who passed on April 2, 2005. He attended humans’ problems, life’s challenges against the culture of death embodied by artificial insemination, cloning and euthanasia. In addition, he gave a particular attention in favor of ecology and he asked the collaboration between man and God for the respect of the environment. He also traveled a lot; in fact he created wonderful relations with his followers and with followers of other religions. The Pope was a big example of forgiveness for people in particular for youth- when he forgave his attacker- . He really gave us a message of peace and love. I think that if I had to choose other country to live, I choose China because I would like to learn more about this place, about its people and about its traditions. I’m really fascinated with their history, for that reason I’m studying Chinese at school. For me, there isn't a particular problem more important than another. I think that the most important problem in the world is the people's inability to find a solution for it. The beauty is not a value independent from the brain moreover a beauty queen has to express her ideas also about a controversial subject if this is required. I think it will be an unforgettable experience. I will be at the top of my possibilities and I will show my personality with humility, simplicity, and determination. Honestly I don’t know any former winner. It has been a short time since I know this competition maybe because I’m young. However, I believe that the next Miss World 2010 surely will be chosen not only for her beauty, but for personal talent, culture and ability to socialize. Beauty in itself is a value and I think that the biggest purpose of a man is to evolve him or herself, using all of his or her potential. In this case, we are speaking about beauty that can be used as a big instrument. I believe in myself and I use my abilities to pursue my dreams, but always using intelligence and sense of responsibility. I am doing my best. Good reading to everybody! Danilo Marzano, from Miss Mondo Italia organization.